The Department of Provincial Administration has published the latest statistics of the numbers of administrative units in Thailand, as of December 31st 2018. The numbers are as follows, with the 2017 numbers in brackets if there were changes. There is only one change recorded, an upgrade of a TAO to a town municipality - which is the upgrade of Bang Khu Rat in Nonthaburi province. I haven't yet reported it on here, and in fact it was effective January 2nd 2019, so claiming the numbers are as of December 31st is not fully correct. As all other numbers stayed identical, it only shows that currently there's almost no activity concerning the administrative units. And as usual, there is still the odd discrepancy of one subdistrict which is not counted in this statistics, but still included in the population data. One interested side-note - this year the document includes an English version, which I haven't seen before. Yesterday, the Royal Gazette contained the announcement on the number of constituencies for each province for the long-delayed first election after the coup, to be held early next year (unless delayed again). While this might look like another big step towards getting ready for the election, in real it is nothing but publishing the result of a simple algorithm on how to spread 350 MPs over 76 provinces depending on their population, to make sure that each constituency has a similar number of eligible votes. As the number of constituency-based MPs changed from 375 to 350 as well as the population numbers changed since the last election, there are many provinces which will have a different number of MPs. But in real this is just the minor part of the preparing the constituencies, running the algorithm is something done in few seconds. The real work is the definition of the constituencies themselves, splitting the area of each province into different parts having a similar population number. Even in those cases where a province has now the same number of constituencies as in 2013, the 2013 definition might have to get modified if the population within the different parts of the province has changed and would make the electoral weight of each vote too much differing. I only hope the commission has already started with that bigger task way directly after it was set up, and not waiting till the last laws for the election were officially signed - as knowing the constituency boundaries is important to start campaigning, or simply for the parties to select the candidates fitting for each constituency. Obviously, Dok Khamtai district in Phayao province is meant, which already gives the first confusion as that is not in Chiang Rai. That's simply because Phayao province was created in 1977, two years after her birth, so at that time the district was still part of Chiang Rai province. When looking through the list of subdistrict in Dok Khamtai, there is no Don Cheetuan, the only one which is somewhat similar in name in Don Si Chum. Its name is similar enough to explain Cheetuan as a very badly translation/transcription of Si Chum, and its the only subdistrict starting with Don in all of Phayao province. It also fits as the subdistrict was created in 1972 by splitting off 12 administrative villages from Dok Khamthai subdistrict [Gazette]. Thus the place she should look for is Ban Bun Charoen (บ้านบุญเจริญ), Mu 10 of Don Si Chum - isn't it? Sadly, it isn't that easy, because the village numbers are not stable identifiers for a location. Not only are administrative villages split when they grow to much populous, what makes it even moire difficult to identify a village is the fact that whenever a new subdistrict was created, the villages in the original subdistrict got renumbered to keep them as a list without holes. Don Si Chum was split two times, in 1976 San Khong was formed out of three villages from Don Si Chum and another three from Ban Tham [Gazette], and in 1992 eight villages were split off to form Sawang Arom subdistrict [Gazette]. While in many of the Royal Gazette announcements on subdistrict creation the number changes are listed, only since 1993 this is included usually - and for both announcements relevant here it was omitted. Also, usually the village are only referenced by their number, the name is only very rarely added, so the present-day names of the villages are of no help. When renumbering the villages, there are two possible schemes - either keep the original order and shift all the villages starting with the first hole in the list. Or fill the holes by renumbering only the villages with highest numbers, which has the advantage that less villages get a new number. In 1992, the villages 1,2,3,9,12,14,15 and 16 were split off, but without knowing how many Muban there were in the subdistrict at that time its impossible to guess to which number the old 10 was changed. The oldest Muban list with names of this subdistrict I have is from 1998 [Gazette], and that already lists the 10 Muban it has today. Two Muban must have been created between 1972 and 1998, but I have no idea when if they were created before 1992, then Mu 10 might have kept its number again, otherwise the old 10 might now be Mu 1 or 2. In the ccaatt list, the old ID 102204 of Bang Khae Nuea subdistrict (แขวงบางแคเหนือ) is now marked as obsolete. In the rcode list, Huai Yang subdistrict municipality (เทศบาลตำบลห้วยยาง) in Chaiyaphum province now received the code 3676. As no new administrative units were created, its not surprising there were almost no changes. And apparently those new districts in planning did not receive a code yet - unlike in past when many of planned minor districts already had IDs but then weren't created. In the meeting number 35 on July 25th, the board to consider draft laws discussed the renaming of TAO Na Duang (องค์การบริหารส่วนตำบลนาด้วง), Na Duang district, Loei province to Kaeo Methi (องค์การบริหารส่วนตำบลแก้วเมธี). Its the first direct change to an administrative entity discussed in these board for a year when the merge of Wang Nuea was approved. Due to bad timing, I cannot read the transcript - law.moi.go.th is still inaccessible for me from Germany, and during my visit in Thailand recently I downloaded all the PDFs of the past year but this wasn't online then yet. Thus the announcement in the Royal Gazette will show whether the board approved the change or not. The subdistrict Na Duang (ตำบลนาด้วง) is covered by two local governments, Na Duang TAO and Na Duang subdistrict municipality (เทศบาลตำบลนาด้วง). Thus this name change can either mean that the TAO will get upgraded to a municipality soon, or it simply to clean up the name ambiguities of the former sanitary districts in preparation of the proposed upgrade of all TAO to municipalities. The name "Kaeo Methi" is the name of village number 5 of Na Duang subdistrict, which is also the location of the TAO office. The issue why the province governors are all appointed officials sent by the Ministry of Interior and not elected directly by the citizens of the respective province - like it is the case in Bangkok since 1972 - has come back into discussion as it is one of the campaign topics by the newly founded "Future Forward Party" for the forthcoming long-delayed election, as it is mentioned in this interview with the party founder. The website isaanrecords has already followed up this interview with two articles on this topic. First, the summary of a talk by Tanet Charoenmuang given in Maha Sarakham in April, describes the history of the local governments in Thailand compared to the centrally controlled administration. Tanet was a strong proposer of elected governors for many years, and I really should get back to read more of his book "Thailand - A late decentralizing country" which contains his old publications on such topics. In "Core arguments for and against elected governors", an anonymous author again states the administrative history of the provinces vs. the local governments by municipalities. Sadly, there is no comment possible at that posting, so I have to place my nitpicking here. The article states that from 1972 till 1994 there one one municipality in Thailand - which is wrong as there were already 119 municipalities in 1972. 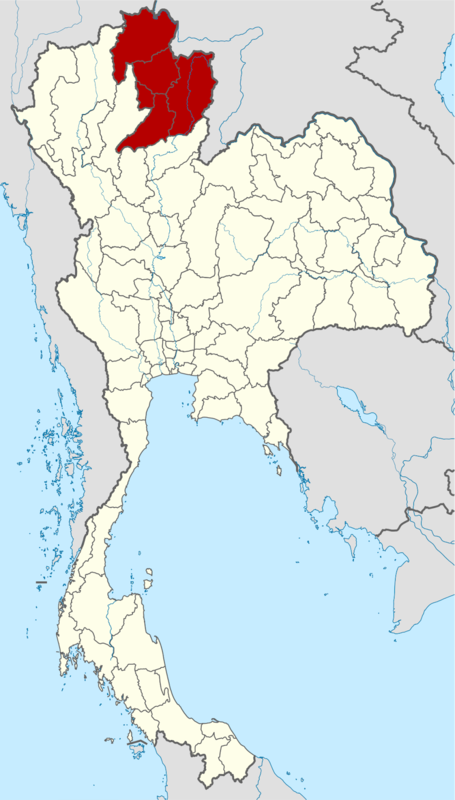 However, what is true is that Chiang Mai was the only municipality of "Thesaban Nakhon" level after Thonburi and Phra Nakhon were merged, and until Nakhon Si Thammarat was upgraded to this highest municipal level. The other odd statement in the article is that BMA is responsible for four provinces, but in real it is only responsible for the special administrative area of Bangkok, which is something like a province. Whereas in Tanets talk the Provincial Administrative Organizations are mentioned, both articles don't mention that these local administrations were changed into fully elected bodies after the 1997 constitution. The the issue of elected vs. appointed province governors was in the political debate in the 1990s, yet the powerful Ministry of Interior at that time was able to block these proposals, and to get the topic from the agenda it gave the electorate these rather powerless local governments in parallel to the centrally controlled province administration. Its is totally quiet with any changes of the civil administrative subdivisions, so to fill the void here its a good distraction that just yesterday the Vatican has erected a new ecclesial subdivision in Thailand. The diocese of Chiang Mai was split, and a new diocese with the seat in Chiang Rai was erected [Vatican news release]. The new diocese of Chiang Rai (Dioecesis Chiangraiensis, สังฆมณฑลเชียงราย) covers the province Chiang Rai, Phayao, Nan and Phrae, and the district Ngao of Lampang province. As only 0.7% of the population are catholic, it is only responsible for 18062 people which in other countries would be just one parish. Joseph Vuthilert Haelom has been appointed as the first bishop, and will take the post officially when he is ordained and consecrated later this year. The Nativity of Our Lady church in mid-town Chiang Rai has become the cathedral of the new diocese. It was interesting to observe how fast after the news release the English Wikipedia got a first article about it, and quickly thereafter a German and Polish version popped up as well - there seem to be many more active editors working on Catholicism topics than the country subdivisions. The bishop so far only has a German biography, and for the cathedral there's so far only the Wikidata entry I created. I now have to create new maps for the dioceses in Wikipedia as well, those created in 2005 have a very limited resolution, as at that time SVG maps were not yet supported. The only difficulty will be to correctly add the boundary between the dioceses of Bangkok and Chanthaburi, which don't follow the administrative boundaries in Chachoengsao province. But at least of the new diocese I am already done, as you can see by the map embedded in this posting. The fact that a good graphical display of data is usually more important (and more difficult) than the collection of the bare data was one thing I learned from the talks in the Wikidata Con last year. Sadly drawing things myself is something I have no talent at all, but lately two of the Facebook feeds I read started to post nice infographics almost daily, of which I will present two here. The DOPA fanpage posted the graphical display of the 2017 entity numbers I presented here earlier this month. Of course the numbers are the same, it being displayed this way of course looks more catchy than the plain table I posted. I don't get why they chose to display mountains for the central administrative units, and their height totally not matches the numbers. For the local administrative units, it was of course very difficult to find any icon to symbolize the Provincial Administrative Organizations (PAO) - it's already difficult to explain the function of those to someone not familiar with the Thai administrative system, and guess many Thai don't know about them either. 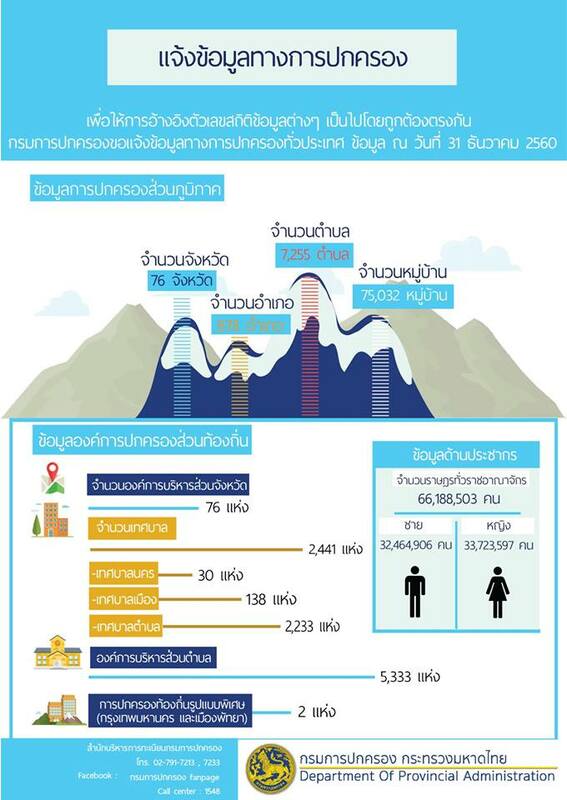 The second graphic is from the facebook feed of the National Statistics Office (NSO). 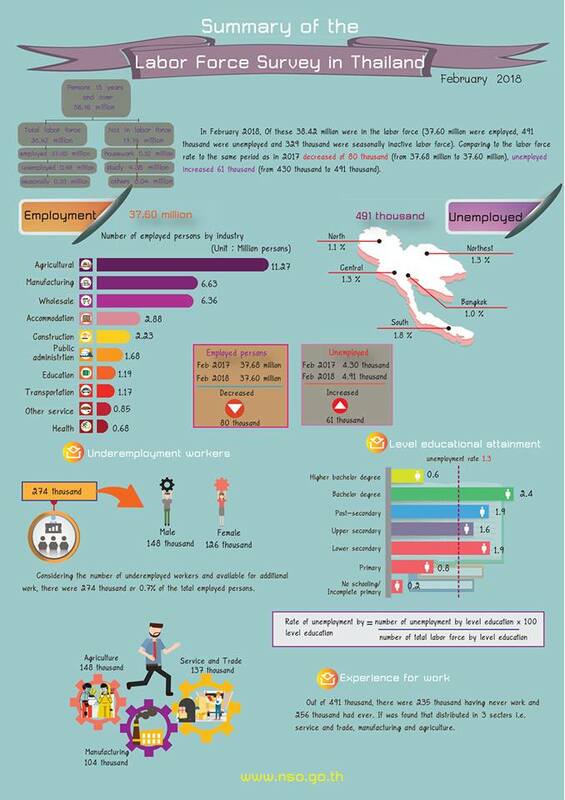 Most of the infographics there are of course in Thai only, but at least one they also posted in an English translation - the Labor Force Survey of February 2018. It shows interesting factoids like the numbers of employees by sector (agriculture still dominants) or the unemployment rate by education - interestingly Bachelor degree holders have the highest unemployment. Would of course be nice if they'd post translated graphics more often. While these graphics are great to catch the eye and give information to the reader, they have one big drawback - they are inaccessible to search engines. Textual data can be easily indexed and then found again later, PDF files are already more difficult especially if the raw text isn't embedded and must the retrieved by OCR, but these pure graphics won't ever be found by Google unless they implement much more artificial intelligence into their crawler. To round up the annual statistics announcements, today the Department of Provincial Administration did publish the numbers of administrative units. The numbers are as follows, with the 2016 numbers in brackets if there were changes. The only change at all is that one subdistrict administrative organization is gone, which was the merge of Wang Nua TAO and municipality. And as usual, there is still the odd discrepancy of one subdistrict which is not counted in this statistics, but still included in the population data. as reported here before, so there shouldn't have been any news about this - but oddly there are some differences. Whereas the total numbers are same, the numbers by nationality (Thai or foreigner) differ. These numbers are a bit hidden on stat.dopa.go.th, as they are only listed with the age pyramid data (see my blog post). For the whole country, the Gazette announcement states that there are 875,814 foreigners, whereas the age pyramid data states there are only 680,549. The difference is that there two more rows in that statistics - the people who are currently moving, i.e. have unregistered at their old registrar but not yet registered at a new location. These are 157,722 people. The even bigger number are 722,717 who are registered only at the central registrar (ทะเบียนบ้านกลาง), but not at any local one. Thus most of the "missing" foreigners are only centrally registered, and thus don't show up as foreigners in the age statistics. I now have to think a bit how to best encode this fact in my XML files, and of course also clean up the previous years for which I already imported one of the numbers.